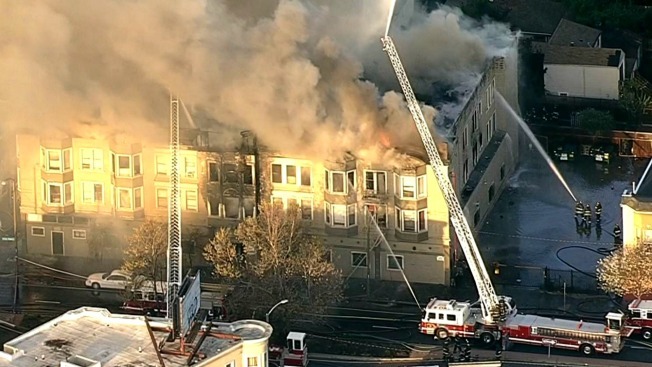 Oakland Mayor Libby Schaaf is asking the public to support the families and individuals affected by the deadly San Pablo Avenue apartment fire last week. The March 27 fire left four dead, injured seven and displaced more than 80 people at 2551 San Pablo Ave. In a statement, Schaaf thanked the many businesses, nonprofits, government agencies, community organizations and city staff for helping the recovery effort. She also asked the public to help raise funds for the victims. "The residents impacted by this fire were facing a number of challenges and barriers before this tragic event occurred and need our help now more than ever," Schaaf said. "I hope you will join the effort to help the families and individuals who lost so much in this fire," she said. According to Schaaf, a coalition of faith-based organizations has designated the First Presbyterian Church of Oakland as the fiscal agent for the San Pablo Victims Advocacy Fund. Check donations can be made out to "FPCO San Pablo Fire Victims Advocacy" and mailed to the church at 2619 Broadway, Oakland, CA 94612. Other city officials, including Councilwoman Rebecca Kaplan, have encouraged donations as well to a fundraising effort by the Oakland Warehouse Coalition, a group set up in the wake of the Ghost Ship fire that killed 36 people in Oakland in December. The fund has gathered nearly $28,000 for the San Pablo Avenue fire victims as of Thursday morning. City officials have said a candle caused the blaze at the building, where residents had previously complained about unsafe living conditions and said they didn't hear smoke or fire alarms going off on the morning of the fire. A temporary shelter for the victims closed Wednesday. City officials said they're working to re-house the remaining displaced residents, who can also obtain services at a temporary assistance center at 270 Frank H. Ogawa Plaza. Meanwhile, the building's owner Keith Kim has hired a law firm, Kronenberg Law, and a public affairs agency, Singer Associates, Inc., in the aftermath of the fire.